The new Tamron 90mm Macro is a fantastic Macro lens that allows for easy handheld shooting. It is fun for getting up close and personal with your subjects, no matter how small. With a MSRP of US $649.00, it is an option yo must see if you are in the market for a macro lens. Read more in our Full Conclusion. 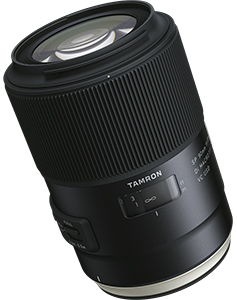 The new Tamron 90mm Macro continues a long line of innovation and quality for this lens. As the 10th installment of this now classic lens, its quality, speed, and accuracy are vital to continuing to this great legacy. Not only great for macro photography, the lens is fantastic for shooting portraits as well, making it incredibly versatile. Built to withstand the elements, the body of the lens is moisture-proof and dust-resistant, assuring you that the lens can handle any conditions that your camera can. This new model features an upgraded VC system that now incorporates shift compensation on the x and y axis, for increased stabilization. They have also improved the AF system with a new Ultrasonic Silent Drive motor that has been specifically optimized for macro photography. Add some state of the art lens coatings that greatly decreases flare, ghosting, and other flaws from your images, and you have one fantastic macro lens.